The SilverDome® nxt offers versatility and ease-of-use with beautiful lighting results. It is ideal for overhead installations where hot lights are used and can be used with strobes or continuous lighting. Switch between large source soft lighting and higher contrast lighting in seconds by removing the Velcro attached face. 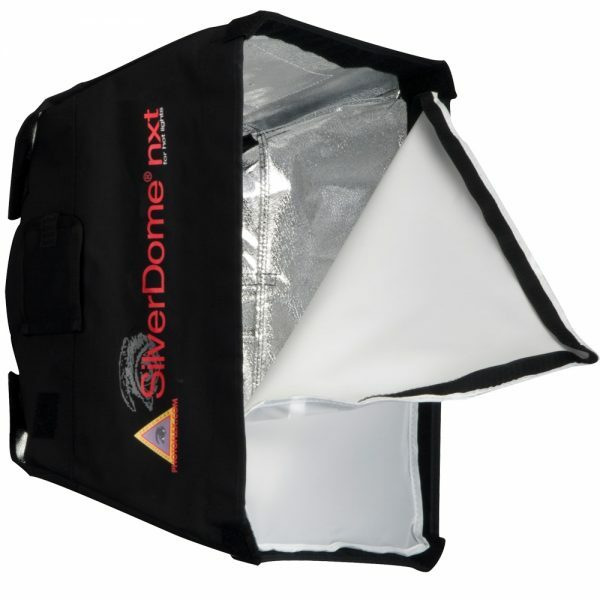 Soft box shell made from heat-resistant Brimstone® fabric. Silver interior ensures maximum light output. The SilverDome® nxt comes in 5 sizes. Connectors are required to fit your strobe or continuous lights and are sold separately. Photoflex as a company makes very good products. I own a few reflectors, reflector holders and I find their materials to be a lot better in quality. As for me, Mr. Fast and Light, run around adventure photographer guy, I’m sold. I feel that the [PHotoflex] TritonFlash has added an entire new dimension to my photography, especially to my style of Going Fast With Light.